Would you feel more secure if you knew the seismic rating of a building you were working in, walking by (such as those in Cuba Mall) or perhaps wanting to hold a function in (such as the Wellington Town Hall)? 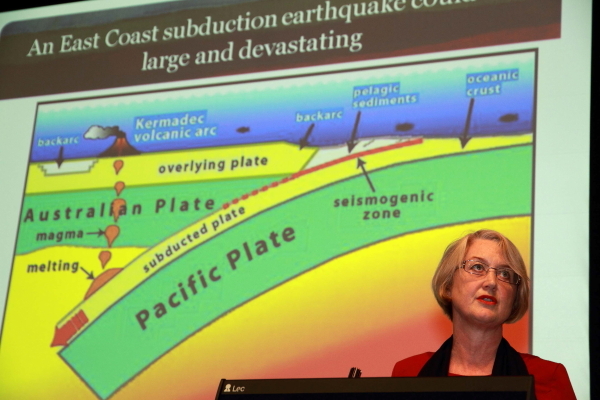 Dr Helen Anderson, a seismologist and a director of BRANZ, suggested that such useful information might be best put in a colloquial way, rather than the complicated, technical speak of engineers. So, how about "safe as" (for buildings at 100 per cent of National Building Standards) through "OK", "a bit marginal", to "dodgy" and the worst, a very clear "Dangerous" (under 30 per cent of Code). On this scale, the Wellington Town Hall ranks as dangerous. 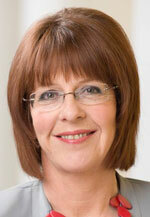 Dr Anderson says that she no longer attends functions there as it is below 30 per cent of the current Code. Mayor Celia Wade-Brown said citizens will need to get engaged in the debate as the Council gets tough on buildings – what do people want to preserve, and what are we prepared to pay to do so? 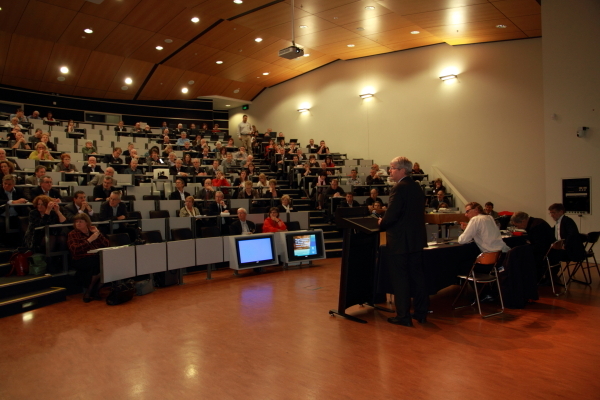 Anderson's ratings were well received by a crowded Rotary Forum on Tuesday 18 October, held in partnership with Victoria University of Wellington at Rutherford House on the Pipitea Campus. More than 200 people from around New Zealand heard some 17 speakers reflect on their personal experience in leading organisations affected by, or responding to, the Christchurch earthquakes. 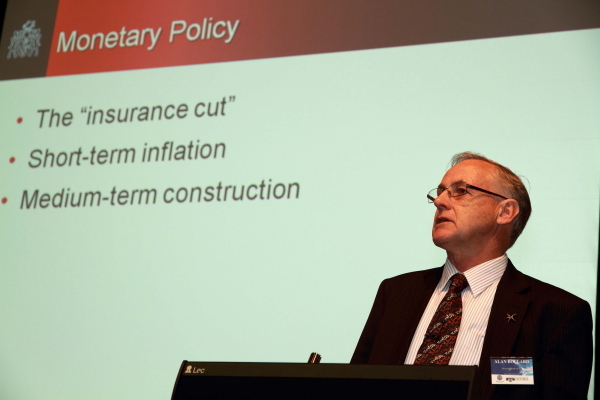 This included Reserve Bank Governor Dr Alan Bollard who told us that the Bank flew in by private plane the equivalent of $350 cash per head of population, in order to satisfy the demand for cash in the immediate aftermath; and how New Zealand needed to reflect on what is the right balance between risk and cost (financial and regulatory). He reminded us that there will be other natural disasters, whether from flood, volcanoes, tsunami or earthquake, at some unknown part of the country, at some unknown time – and that New Zealand is almost uniquely isolated from nearby sources of help. Dr Bollard put this quake into an economic context, acknowledging that he could not describe the terrible human cost. The cost is about 10 per cent of our national GDP. No other OECD country has had such a blow, relative to GDP. Even Japan's recent earthquake and tsunami tragedy is "only" about 3-4 per cent of its GDP. In part, we are lucky – New Zealand in general and Christchurch in particular is well-insured and the insurers and re-insurers will pay out. Bollard also noted that we need to think beyond disaster as a single event – natural disasters in particular may linger for a long while, as the aftershock sequence illustrates. Peter Townsend, CEO of the Canterbury Employers' Chamber of Commerce said that the cost will be more like $30 billion than the $20 or $25bn estimated by the Reserve Bank. Townsend said the region is desperate to retain both people and capital in order to rebuild and grow. In a theme repeated by others, he said that Christchurch will be rebuilt but not recreated – it will be different from what existed for 150 years prior. This will be a 10,20 or 30 year project. 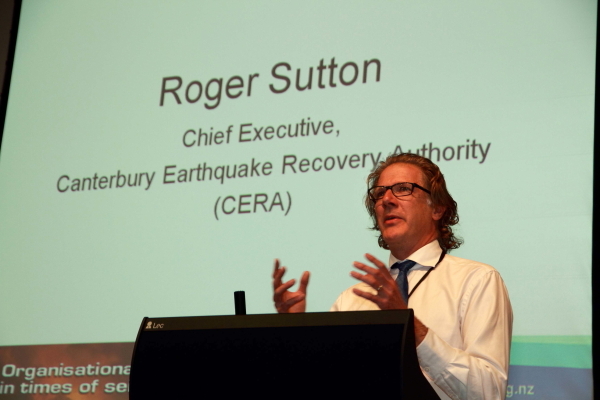 Roger Sutton, CEO of the Canterbury Earthquake Recovery Authority (CERA) also said that the new Christchurch will be different. But how different and in what time frame, who knows? He said a profound discussion needs to be had on the implications of rebuilding Christchurch fast – with all the attendant need for labour probably brought in from offshore – versus taking time to get it right. There are 1200 buildings in the CBD to come down. If you buy the wrong car, you live with that mistake for say 5 years – get the new city wrong, and you will have to live with that for at least 100 years. 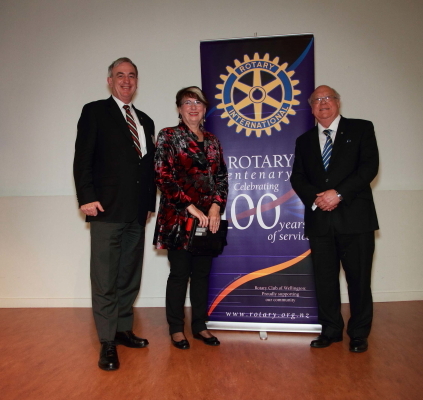 These were just some of the speakers at the first Rotary Forum, a joint project between the Rotary Club of Wellington and Victoria University of Wellington. The Forum was a tremendous success. The buzz at break times, and the rapt attention and quality of questions and discussion showed this – and was backed up the excellent written evaluations received afterwards. The speakers had clearly prepared well. Each provided wisdom, insight and a revealing honesty about their personal and professional responses. This was information and insight that could be used by any attendee, at any level of their organisation or even for family and household use. The speakers were all active participants in responding on the day, in restoring confidence and organisational effectiveness in the days following, and in leadership for Christchurch now and decades ahead. The Forum was a major event, initiated and carried out in short order to a very high standard. Geoff Bascand led a committee of Trojans in a tremendously well organised and executed exercise. The result was a top-rate slew of speakers (not least some of our own members, who were on the programme on their merits) and a day that went without a hitch. 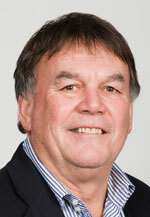 The concept of the Forum, which may well become annual, is to address an issue of major importance to Wellington. It utilises our Club's wealth of community engagement, networks and leadership roles to enable an extraordinary and unique contribution to our community. We may not cut wood for pensioners as once we did as a Club – but the effect from this Forum will be warming the discussions and causing action from many a senior management team, insurance broker, central and local government official and politician for some time to come. It shows our Club is still pioneering leadership for our city, in ways appropriate to the 21st century. Indeed, the outreach from this event has covered New Zealand, although the media sometimes seem reluctant to acknowledge Rotary. 17 experts and leaders presented, starting from top left: Dr Alan Bollard, Allan Freeth, Dr Helen Anderson, Margaret Jeffries, Dave Middleton, Peter Townsend, Jacki Johnson, Steve Brazier(did not present on the day), Bill Butzbach, Geoff Bascand, Charles Waldegrave, Richard Ballantyne, Professor Bruce Glavovic, Colin James, Ian Athfield, Roger Sutton and Fran Wilde. Original generation time 1.3608 seconds. Cache Loaded in: 0.0219 seconds.